Middle East Perspectives by Rick Francona: Russia and Turkey broker a ceasefire in Syria - where is the United States? Russia and Turkey broker a ceasefire in Syria - where is the United States? A ceasefire in Syria, brokered by the Russians and the Turks, is scheduled to take effect at midnight on Thursday. Notably absent from any of the negotiations was the United States. Russian President Vladimir Putin made a statement outlining the agreement, and in effect, marginalized any American role in resolving the six-year conflict in the country. 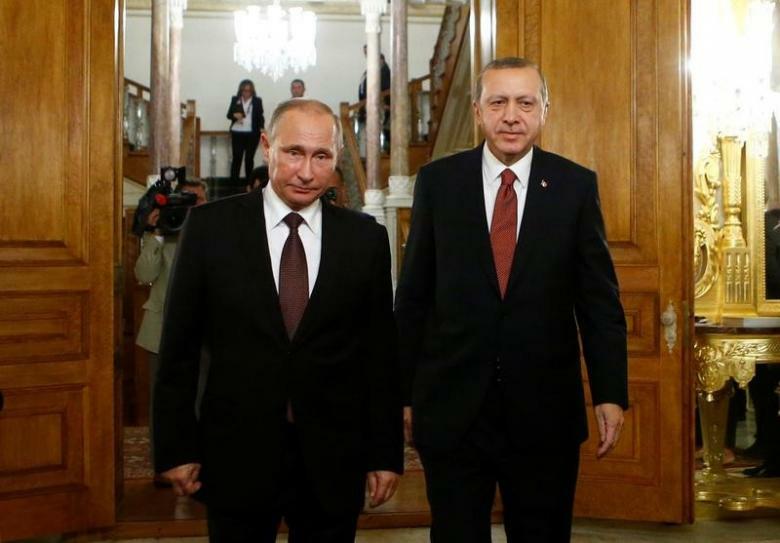 The Russian-Turkish brokered ceasefire follows a December 20 meeting in Moscow between the foreign ministers of Russia, Iran and Turkey to discuss the future of Syria, both short and long term. A ceasefire was one of the topics, as was the potential for a political solution to the civil war. The ceasefire agreement announced by Mr. Putin seems to have addressed both. It appears that once again, President Putin and his foreign minister, Sergey Lavrov, have outplayed American President Barack Obama and Secretary of State John Kerry. As I have said in the past, the new power brokers in the region - especially when it comes to Syria - are Russia, Turkey and Iran. While all of us are pleased that there is a chance for a cessation of the bloodshed in war-torn Syria, it remains to be seen if this ceasefire will have any greater chance of success than the preceding attempts. Mr. Putin called the ceasefire "fragile." As with previous ceasefire agreements, the parties to this agreement are the Syrian government and its allies on one side, and the armed opposition on the other. Syria's regime is backed militarily by a tightly-managed coalition of Russia, Iran, and Lebanese Hizballah, as well as Iraqi and Afghan Shi'a militias. About half of the ground forces fighting for the al-Asad regime are provided by these alliance groups. However, it was the introduction of Russian airpower in September 2015 that guaranteed the survival of the Bashar al-Asad government, allowed the regime to regain momentum in its military operations, and to retake the city of Aleppo. It is also important to note that, as in previous ceasefires, the agreement does not include groups labeled as terrorists. Those groups specifically include the Islamic State in Iraq and Syria (ISIS) and the former al-Qaidah affiliate in Syria, now known as Jabhat Fatah al-Sham (JFS, Levant Conquest Front). However, some groups that have been labeled as terrorists in the past, such as Ahrar al-Sham, are now included in the scope of this agreement. If past precedent holds, agreement on what constitutes a terrorist group will still be an issue. The exact wording in the agreement defines groups that can be attacked as "those associated with" designated terrorist groups. The Syrian regime regards virtually any group that has taken up arms against it as a terrorist group. In the Arabic-language Syrian government-controlled press, the words rebel and opposition are not used - all opposition is labeled terrorism. There is no doubt that the opposition has suffered recent setbacks - the loss of its stronghold in east Aleppo was a strategic, tactical and symbolic defeat. The Syrian coalition now has the momentum. I expect that after totally securing the city of Aleppo, they will turn their attention to neighboring Idlib governorate and use their successful seizure of Aleppo as the template to expel the rebels from that area. Unless the situation changes, I do not think the opposition will be able to prevent this regime coalition operation from succeeding. The opposition knows it is now in a much weakened position and that they have lost much of their leverage in negotiations with the regime. If the opposition can get something that guarantees that they will have a voice in a future political settlement, they will likely adhere to the agreement. That is a tall order, however - the two sides are still far apart. The Russians believe that any future political solution must include the continuance of the Bashar al-Asad government, while Turkey and the opposition want the future of the present government to be on the table as well. There is one group that is not included in the agreement which the United States considers to be part of the fight against ISIS. This is the Syrian Democratic Front (SDF, or in Arabic QSD), composed of Sunni Arabs and Kurdish fighters who are members of the Syrian Kurdish group known as the YPG. The U.S.-led coalition supports the SDF with airstrikes, weapons and on-the-ground advisers. They have proven themselves to be effective against ISIS, and are now only about 15 miles from the ISIS capital of al-Raqqah. The Turks consider the YPG to be nothing more than an extension of the PKK, a Kurdish separatist organization designated as a terrorist group by the United States, NATO and the European Union. The situation is more than mere rhetoric - Turkish aircraft have bombed SDF units, despite the fact that these units are engaged in direct combat with ISIS. Part of the agreement calls for talks on a future political settlement in Syria after the ceasefire holds for 30 days. Those talks will be held in Astana, Kazakhstan - again with no American participation. The Russians did note that after January 20, the Trump Administration may be asked to play a role. I suspect that President-elect Trump's statements have partially shaped this ceasefire and political settlement talks framework. Mr. Trump has hinted that he is not in favor of continuing American policy demanding the removal of the current Syrian government, and thus ending what covert support to the opposition that exists. The opposition may believe that they may be losing American sponsorship and should take this opportunity to at least have some say in Syria's future. I further suspect that the Russians are hoping that a Trump Administration might be amenable to coordinated or joint operations against ISIS. While many senior U.S. military officers are wary of closer ties with the Russians, the Russian and Turks are now in the drivers' seats.